You can buy a brand new Ford, Cadillac, GMC, Dodge, Chrysler, Jeep, RAM, Buick, or any used vehicle just about anywhere in Guthrie, OK or around Edmond, OK. However, there is only one place you should go to get the best car buying experience and prices in Oklahoma and that is right here at the John Vance Auto Group, home of the Vance Country Ford, John Vance Chrysler Dodge Jeep Ram and John Vance GMC Cadillac Buick. Our easily accessible online car shopping experience coupled with our friendly staff makes your new or used car buying experience fun and stress-free. We have a vehicle that suits just about everyone’s needs and is just down the road from Edmond or OKC, OK. We are not your average dealer in Guthrie, you will see and experience the difference the moment you walk into our showroom. Like so many other Oklahoma residents, we hope you choose us for your next new or used car purchase! SXT trim. EPA 27 MPG Hwy/23 MPG City! iPod/MP3 Input, CD Player, Aluminum Wheels, Satellite Radio, newCarTestDrive.com's review says Inexpensive and economical.. 5 Star Driver Front Crash Rating. READ MORE! KEY FEATURES INCLUDE Satellite Radio, iPod/MP3 Input, CD Player, Aluminum Wheels. Rear Spoiler, MP3 Player, Keyless Entry, Child Safety Locks, Bucket Seats. EXPERTS RAVE The Caliber earned perfect scores in National Highway Traffic Safety Administration crash tests, including five stars in both frontal and side impacts. -Edmunds.com. 5 Star Driver Front Crash Rating. 5 Star Driver Side Crash Rating. Great Gas Mileage: 27 MPG Hwy. VISIT US TODAY Located in Miami, OK, Vance Auto Group is proud to be your premier dealership in the area. From the moment you walk into our showroom, you'll know our commitment to Customer Service is second to none. We strive to make your experience with Vance Auto Group a good one – for the life of your vehicle. Whether you need to Purchase, Finance or Service a New or Pre-Owned Vehicle, you've come to the right place. All prices include all applicable rebates and incentives. Pricing analysis performed on 4/20/2019. Fuel economy calculations based on original manufacturer data for trim engine configuration. Please confirm the accuracy of the included equipment by calling us prior to purchase. GS trim, Light Ice Blue Metallic exterior and Medium Light Stone interior. In Good Shape. REDUCED FROM $5,900! CD Player, Flex Fuel, PREMIUM CLOTH TWIN COMFORT SEATS. 5 Star Driver Front Crash Rating. SEE MORE! KEY FEATURES INCLUDE Flex Fuel, CD Player. Keyless Entry, Remote Trunk Release, Child Safety Locks, 4-Wheel ABS, Tire Pressure Monitoring System. OPTION PACKAGES PREMIUM CLOTH TWIN COMFORT SEATS 8-way pwr driver seat w/pwr lumbar & recline (STD). Mercury GS with Light Ice Blue Metallic exterior and Medium Light Stone interior features a 8 Cylinder Engine with 224 HP at 4800 RPM*. EXPERTS ARE SAYING Edmunds.com explains Hiproom and shoulder room are particularly impressive.. 5 Star Driver Front Crash Rating. 5 Star Driver Side Crash Rating. AFFORDABILITY Was $5,900. MORE ABOUT US Located in Miami, OK, Vance Auto Group is proud to be your premier dealership in the area. From the moment you walk into our showroom, you'll know our commitment to Customer Service is second to none. We strive to make your experience with Vance Auto Group a good one – for the life of your vehicle. Whether you need to Purchase, Finance or Service a New or Pre-Owned Vehicle, you've come to the right place. All prices include all applicable rebates and incentives. Pricing analysis performed on 4/20/2019. Horsepower calculations based on trim engine configuration. Please confirm the accuracy of the included equipment by calling us prior to purchase. WAS $9,998, EPA 25 MPG Hwy/17 MPG City! CARFAX 1-Owner. SXT trim. 3rd Row Seat, iPOD/AUX INPUT, SAT RADIO, CD PLAYER, 17 X 6.5 ALUMINUM WHEELS, POPULAR EQUIPMENT GROUP, FLEXIBLE SEATING GROUP, 3.6L VVT V6 24-VALVE ENGINE. AND MORE! KEY FEATURES INCLUDE SAT RADIO, iPOD/AUX INPUT, CD PLAYER MP3 Player, Privacy Glass, Keyless Entry, Child Safety Locks, Steering Wheel Controls. OPTION PACKAGES 3.6L VVT V6 24-VALVE ENGINE, FLEXIBLE SEATING GROUP 2nd row 40/60 tilt & slide bench seat, 3rd row 50/50 fold/reclining bench seat, air cond w/3 zone temp control, easy entry system seat, rear air cond w/heater, POPULAR EQUIPMENT GROUP high beam daytime running headlamps, front/rear aimable LED reading lamps, front passenger fold-flat seat, interior observation mirror, overhead console, passenger assist handles, passenger seat cushion storage, 4-way pwr driver lumbar adjust, 6-way pwr driver seat, premium cloth low-back bucket seats, remote engine start, dual visors w/illuminated mirrors, auto headlamps, universal garage door opener, security alarm, 17 X 6.5 ALUMINUM WHEELS (STD), 6-SPEED AUTOMATIC TRANSMISSION. Dodge SXT with Brilliant Black Crystal Pearl exterior and Black interior features a V6 Cylinder Engine with 283 HP at 6350 RPM*. VEHICLE REVIEWS A sharp new interior, a new optional V-6, and a host of chassis upgrades made this Avenger-based SUV a class contender. -CarAndDriver.com. Great Gas Mileage: 25 MPG Hwy. PRICED TO MOVE Reduced from $9,998. All prices include all applicable rebates and incentives. Horsepower calculations based on trim engine configuration. Fuel economy calculations based on original manufacturer data for trim engine configuration. Please confirm the accuracy of the included equipment by calling us prior to purchase. Tundra trim. FUEL EFFICIENT 20 MPG Hwy/15 MPG City! ..CD PLAYER.., ..IPOD/MP3 INPUT.., KBB.com explains The tall seating position makes it easy to see the highway ahead.. KEY FEATURES INCLUDE . IPOD/MP3 INPUT. CD PLAYER. MP3 PLAYER, DUAL ZONE A/C, KEYLESS ENTRY, CHILD SAFETY LOCKS, ELECTRONIC STABILITY CONTROL. EXPERTS ARE SAYING CarAndDriver.com explains The Tundra is a capable truck, especially when equipped with the powerful 5.7-liter V-8.. Great Gas Mileage: 20 MPG Hwy. WHY BUY FROM US For over 35 years John Vance Auto Group has been a comfortable place to buy a car. Serving the Oklahoma City metro area and with 11 domestic makes to choose from we are sure you can find the next car, truck or SUV of your dreams. The John Vance Auto Group is located just minutes north of Oklahoma City in Guthrie, OK on I-35 exit 153. Come see why the John Vance Auto Group is a comfortable place to buy a car. All prices include all applicable rebates and incentives. Pricing analysis performed on 4/23/2019. Fuel economy calculations based on original manufacturer data for trim engine configuration. Please confirm the accuracy of the included equipment by calling us prior to purchase. SE trim. CARFAX 1-Owner, ONLY 23,000 Miles! EPA 39 MPG Hwy/29 MPG City! Onboard Communications System, Smart Device Integration, iPod/MP3 Input, CD Player. READ MORE! KEY FEATURES INCLUDE iPod/MP3 Input, CD Player, Onboard Communications System, Smart Device Integration. MP3 Player, Keyless Entry, Steering Wheel Controls, Child Safety Locks, Heated Mirrors. VEHICLE REVIEWS CarAndDriver.com's review says The Fiesta sedan returns good fuel mileage, handles decently, has an attractive interior, offers good forward visibility, and is relatively comfortable.. Great Gas Mileage: 39 MPG Hwy. All prices include all applicable rebates and incentives. Fuel economy calculations based on original manufacturer data for trim engine configuration. Please confirm the accuracy of the included equipment by calling us prior to purchase. CARFAX 1-Owner. JUST REPRICED FROM $9,750, EPA 32 MPG Hwy/22 MPG City! SLE-1 trim. Aluminum Wheels, REAR VIEW CAMERA, HANDS FREE SYSTEM, ENGINE, 2.4L DOHC 4-CYLINDER SIDI (SP... TRANSMISSION, 6-SPEED AUTOMATIC. READ MORE! KEY FEATURES INCLUDE REAR VIEW CAMERA, HANDS FREE SYSTEM, ALLOY WHEELS. Privacy Glass, Keyless Entry, Child Safety Locks, Steering Wheel Controls, Heated Mirrors. OPTION PACKAGES AUDIO SYSTEM, AM/FM/SIRIUSXM STEREO WITH CD PLAYER AND MP3 PLAYBACK CAPABILITY 7-inch touch-screen Color Interface Display (CID), USB port, Radio Data System (RDS), speed compensated volume, auxiliary input jack and outside temperature display (STD), TRANSMISSION, 6-SPEED AUTOMATIC (STD), ENGINE, 2.4L DOHC 4-CYLINDER SIDI (SPARK IGNITION DIRECT INJECTION) with VVT (Variable Valve Timing) (182 hp [135.7 kW] @ 6700 rpm, 172 lb-ft [232.2 N-m] @ 4900 rpm) (STD). GMC SLE-1 with OLYMPIC WHITE exterior and JET BLACK interior features a 4 Cylinder Engine with 182 HP at 6700 RPM*. EXPERTS ARE SAYING CarAndDriver.com explains Solid, well-equipped platform; powerful brakes; larger than competitors.. Great Gas Mileage: 32 MPG Hwy. AFFORDABILITY Was $9,750. PURCHASE WITH CONFIDENCE CARFAX 1-Owner All prices include all applicable rebates and incentives. Horsepower calculations based on trim engine configuration. Fuel economy calculations based on original manufacturer data for trim engine configuration. Please confirm the accuracy of the included equipment by calling us prior to purchase. CARFAX 1-Owner, In Good Shape. Laredo trim. Satellite Radio, CD Player, Dual Zone A/C, Alloy Wheels, SECURITY & CONVENIENCE GROUP, 5-SPEED AUTOMATIC TRANSMISSION, 3.6L VVT V6 FLEX-FUEL ENGINE. AND MORE! THIS JEEP GRAND CHEROKEE IS COMPLETELY EQUIPPED SECURITY & CONVENIENCE GROUP 115V aux pwr outlet, cargo compartment cover, remote start, auto-dimming rear view mirror w/microphone, security alarm, UConnect phone w/voice command, universal garage door opener, USB port, Bluetooth, 3.6L VVT V6 FLEX-FUEL ENGINE (STD), 5-SPEED AUTOMATIC TRANSMISSION (STD) JEEP GRAND CHEROKEE: UNMATCHED QUALITY CARFAX 1-Owner. Qualifies for CARFAX Buyback Guarantee. KEY FEATURES ON THIS GRAND CHEROKEE INCLUDE Satellite Radio, CD Player, Aluminum Wheels, Dual Zone A/C Rear Spoiler, Keyless Entry, Privacy Glass, Steering Wheel Controls, Child Safety Locks. Jeep Laredo with White Gold exterior and Dark Graystone/Medium Graystone Interior interior features a V6 Cylinder Engine with 290 HP at 6400 RPM*. BEST IN CLASS: GRAND CHEROKEE The Most Awarded SUV Ever. (www.jeep.com) The Grand Cherokee offers more 2nd Row Leg Room than Honda Pilot and Toyota 4Runner. You will also get More Highway and City Cruising Range Miles than the Ford Flex, Ford Explorer, and Honda Pilot. With 35.1 cubic feet of Cargo Volume (behind 2nd row) WHO WE ARE Located in Miami, OK, Vance Auto Group is proud to be your premier dealership in the area. From the moment you walk into our showroom, you'll know our commitment to Customer Service is second to none. We strive to make your experience with Vance Auto Group a good one – for the life of your vehicle. Whether you need to Purchase, Finance or Service a New or Pre-Owned Vehicle, you've come to the right place. All prices include all applicable rebates and incentives. Pricing analysis performed on 4/20/2019. Horsepower calculations based on trim engine configuration. Please confirm the accuracy of the included equipment by calling us prior to purchase. FUEL EFFICIENT 39 MPG Hwy/28 MPG City! LX trim, Crimson Pearl exterior and Beige interior. ..BLUETOOTH....CD PLAYER....BACK-UP CAMERA....IPOD/MP3 INPUT.. KEY FEATURES INCLUDE . BACK-UP CAMERA. IPOD/MP3 INPUT. BLUETOOTH. CD PLAYER. MP3 PLAYER, KEYLESS ENTRY, REMOTE TRUNK RELEASE, STEERING WHEEL CONTROLS, CHILD SAFETY LOCKS. Honda LX with Crimson Pearl exterior and Beige interior features a 4 Cylinder Engine with 140 HP at 6500 RPM*. EXPERTS RAVE Edmunds.com explains Just one year after the model's poorly received redesign, the 2013 Honda Civic benefits from a significant refresh that should help restore its luster in the competitive compact-car category.. Great Gas Mileage: 39 MPG Hwy. VISIT US TODAY For over 35 years John Vance Auto Group has been a comfortable place to buy a car. Serving the Oklahoma City metro area and with 11 domestic makes to choose from we are sure you can find the next car, truck or SUV of your dreams. The John Vance Auto Group is located just minutes north of Oklahoma City in Guthrie, OK on I-35 exit 153. Come see why the John Vance Auto Group is a comfortable place to buy a car. All prices include all applicable rebates and incentives. Pricing analysis performed on 4/19/2019. Horsepower calculations based on trim engine configuration. Fuel economy calculations based on original manufacturer data for trim engine configuration. Please confirm the accuracy of the included equipment by calling us prior to purchase. LTZ trim. FUEL EFFICIENT 29 MPG Hwy/20 MPG City! Heated Leather Seats..ALL WHEEL DRIVE....BACK-UP CAMERA....PREMIUM SOUND SYSTEM.. TRANSMISSION, 6-SPEED AUTOMATIC WITH.. ENGINE, 2.4L DOHC 4-CYLINDER SIDI (SP... Aluminum Wheels KEY FEATURES INCLUDE . LEATHER SEATS. ALL WHEEL DRIVE. HEATED DRIVER SEAT. BACK-UP CAMERA. PREMIUM SOUND SYSTEM. POWER LIFTGATE, ONBOARD HANDS-FREE COMMUNICATIONS SYSTEM, PRIVACY GLASS, REMOTE TRUNK RELEASE, KEYLESS ENTRY. OPTION PACKAGES AUDIO SYSTEM, COLOR TOUCH AM/FM/SIRIUSXM STEREO WITH CD PLAYER AND MP3 PLAYBACK includes 7 diagonal color touch-screen display, USB and AUX port and iPod support (STD), TRANSMISSION, 6-SPEED AUTOMATIC WITH OVERDRIVE (STD), ENGINE, 2.4L DOHC 4-CYLINDER SIDI (SPARK IGNITION DIRECT INJECTION) with VVT (Variable Valve Timing)(182 hp [135.7 kW] @ 6700 rpm, 172 lb-ft [232.2 N-m] @ 4900 rpm) (STD). Chevrolet LTZ with SUMMIT WHITE exterior and JET BLACK interior features a 4 Cylinder Engine with 182 HP at 6700 RPM*. EXPERTS ARE SAYING CarAndDriver.com's review says The big kid in the compact segment, parsimonious four-cylinder engine, spacious rear seat, techno-goodies, solid feel.. Great Gas Mileage: 29 MPG Hwy. WHO WE ARE For over 35 years John Vance Auto Group has been a comfortable place to buy a car. Serving the Oklahoma City metro area and with 11 domestic makes to choose from we are sure you can find the next car, truck or SUV of your dreams. The John Vance Auto Group is located just minutes north of Oklahoma City in Guthrie, OK on I-35 exit 153. Come see why the John Vance Auto Group is a comfortable place to buy a car. All prices include all applicable rebates and incentives. Horsepower calculations based on trim engine configuration. Fuel economy calculations based on original manufacturer data for trim engine configuration. Please confirm the accuracy of the included equipment by calling us prior to purchase. LS trim. CARFAX 1-Owner. REDUCED FROM $13,995!, EPA 37 MPG Hwy/27 MPG City! iPod/MP3 Input, Back-Up Camera, Onboard Communications System, WiFi Hotspot, Keyless Start, ENGINE, 1.5L TURBO DOHC 4-CYLINDER DI... Turbo Charged CLICK NOW! KEY FEATURES INCLUDE Back-Up Camera, iPod/MP3 Input, Onboard Communications System, Aluminum Wheels, Keyless Start, WiFi Hotspot MP3 Player, Keyless Entry, Child Safety Locks, Steering Wheel Controls, Electronic Stability Control. OPTION PACKAGES TRANSMISSION, 6-SPEED AUTOMATIC (STD), ENGINE, 1.5L TURBO DOHC 4-CYLINDER DI with Variable Valve Timing (VVT) (160 hp [119.3 kW] @ 5700 rpm, 184 lb-ft torque [248.4 N-m] @ 2500-3000 rpm) (STD), AUDIO SYSTEM, CHEVROLET MYLINK RADIO WITH 7 DIAGONAL COLOR TOUCH-SCREEN, AM/FM STEREO with seek-and-scan and digital clock, includes Bluetooth streaming audio for music and select phones; featuring Android Auto and Apple CarPlay capability for compatible phone (STD). Chevrolet LS with SILVER ICE METALLIC exterior and Jet Black interior features a 4 Cylinder Engine with 160 HP at 5700 RPM*. EXPERTS ARE SAYING Great Gas Mileage: 37 MPG Hwy. AFFORDABLE Reduced from $13,995. 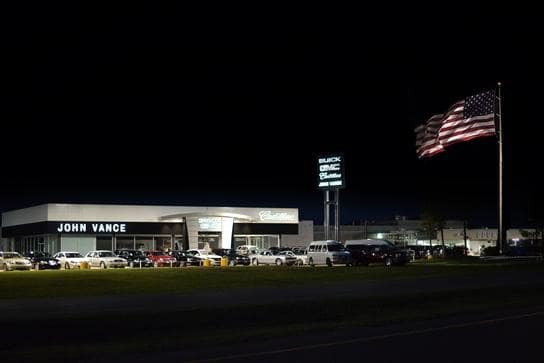 WHO WE ARE Located in Miami, OK, Vance Auto Group is proud to be your premier dealership in the area. From the moment you walk into our showroom, you'll know our commitment to Customer Service is second to none. We strive to make your experience with Vance Auto Group a good one – for the life of your vehicle. Whether you need to Purchase, Finance or Service a New or Pre-Owned Vehicle, you've come to the right place. All prices include all applicable rebates and incentives. Pricing analysis performed on 4/20/2019. Horsepower calculations based on trim engine configuration. Fuel economy calculations based on original manufacturer data for trim engine configuration. Please confirm the accuracy of the included equipment by calling us prior to purchase. CARFAX 1-Owner, In Good Shape, ONLY 23,125 Miles! JUST REPRICED FROM $13,855, EPA 40 MPG Hwy/32 MPG City! Yaris iA trim. Bluetooth, Keyless Start, Smart Device Integration, Alloy Wheels, Back-Up Camera, iPod/MP3 Input SEE MORE! KEY FEATURES INCLUDE Back-Up Camera, iPod/MP3 Input, Bluetooth, Aluminum Wheels, Keyless Start, Smart Device Integration MP3 Player, Keyless Entry, Child Safety Locks, Steering Wheel Controls, Electronic Stability Control. Toyota Yaris iA with Sapphire exterior and Mid Blue Black interior features a 4 Cylinder Engine with 106 HP at 6000 RPM*. EXPERTS REPORT Edmunds.com's review says Happily, trunk capacity is above average for the class, with 13.5 cubic feet of capacity. The low liftover height and remote seatback release further improve usability.. Great Gas Mileage: 40 MPG Hwy. A GREAT VALUE Reduced from $13,855. BUY WITH CONFIDENCE CARFAX 1-Owner WHY BUY FROM US Located in Miami, OK, Vance Auto Group is proud to be your premier dealership in the area. From the moment you walk into our showroom, you'll know our commitment to Customer Service is second to none. We strive to make your experience with Vance Auto Group a good one – for the life of your vehicle. Whether you need to Purchase, Finance or Service a New or Pre-Owned Vehicle, you've come to the right place. All prices include all applicable rebates and incentives. Pricing analysis performed on 4/20/2019. Horsepower calculations based on trim engine configuration. Fuel economy calculations based on original manufacturer data for trim engine configuration. Please confirm the accuracy of the included equipment by calling us prior to purchase. FUEL EFFICIENT 38 MPG Hwy/28 MPG City! CARFAX 1-Owner. SE trim. ..CD PLAYER....IPOD/MP3 INPUT....SATELLITE RADIO. KEY FEATURES INCLUDE . SATELLITE RADIO. IPOD/MP3 INPUT. CD PLAYER. MP3 PLAYER, REMOTE TRUNK RELEASE, KEYLESS ENTRY, CHILD SAFETY LOCKS, ALARM. EXPERTS RAVE Edmunds.com explains The Elantra sedan has a large 14.8-cubic-foot trunk, which is more capacity than most rivals, and the liftover height is low.. Great Gas Mileage: 38 MPG Hwy. WHY BUY FROM US For over 35 years John Vance Auto Group has been a comfortable place to buy a car. Serving the Oklahoma City metro area and with 11 domestic makes to choose from we are sure you can find the next car, truck or SUV of your dreams. The John Vance Auto Group is located just minutes north of Oklahoma City in Guthrie, OK on I-35 exit 153. Come see why the John Vance Auto Group is a comfortable place to buy a car. All prices include all applicable rebates and incentives. Pricing analysis performed on 4/19/2019. Fuel economy calculations based on original manufacturer data for trim engine configuration. Please confirm the accuracy of the included equipment by calling us prior to purchase. CARFAX 1-Owner. REDUCED FROM $12,995!, FUEL EFFICIENT 38 MPG Hwy/26 MPG City! CD Player, iPod/MP3 Input, Onboard Communications System, Brake Actuated Limited Slip Differential, Smart Device Integration, Satellite Radio, Flex Fuel CLICK ME! KEY FEATURES INCLUDE Back-Up Camera, Flex Fuel, Satellite Radio, iPod/MP3 Input, CD Player, Onboard Communications System, Aluminum Wheels, Smart Device Integration, Brake Actuated Limited Slip Differential. Rear Spoiler, MP3 Player, Keyless Entry, Child Safety Locks, Steering Wheel Controls. OPTION PACKAGES MEDIUM LIGHT STONE, CLOTH FRONT BUCKET SEATS 6-way manual driver (up/down, fore/aft, recline), 4-way manual passenger (fore/aft, recline) and removable adjustable head restraints (4-way), TRANSMISSION: 6-SPEED POWERSHIFT AUTOMATIC (STD). Ford SE with Magnetic Metallic exterior and Medium Light Stone interior features a 4 Cylinder Engine with 160 HP at 6500 RPM*. EXPERTS ARE SAYING Edmunds.com explains Much like its upscale interior, the driving characteristics of the 2017 Ford Focus help it stand out in its class. the ride quality is smooth, quiet and docile on the highway or over broken city streets, but it still manages to handle corners well and feel especially sporty for the class.. Great Gas Mileage: 38 MPG Hwy. A GREAT TIME TO BUY Was $12,995. BUY WITH CONFIDENCE CARFAX 1-Owner All prices include all applicable rebates and incentives. Pricing analysis performed on 4/20/2019. Horsepower calculations based on trim engine configuration. Fuel economy calculations based on original manufacturer data for trim engine configuration. Please confirm the accuracy of the included equipment by calling us prior to purchase. Extra Clean, LOW MILES - 29,386! FUEL EFFICIENT 40 MPG Hwy/30 MPG City! ..SATELLITE RADIO...BACK-UP CAMERA....CD PLAYER....IPOD/MP3 INPUT.. CHARCOAL BLACK, CLOTH FRONT BUCKET SE... TRANSMISSION: 6-SPEED POWERSHIFT AUTO... KEY FEATURES INCLUDE . BACK-UP CAMERA. TURBOCHARGED. SATELLITE RADIO. IPOD/MP3 INPUT. CD PLAYER. MP3 PLAYER, ONBOARD HANDS-FREE COMMUNICATIONS SYSTEM, KEYLESS ENTRY, STEERING WHEEL CONTROLS, CHILD SAFETY LOCKS. OPTION PACKAGES TRANSMISSION: 6-SPEED POWERSHIFT AUTOMATIC, CHARCOAL BLACK, CLOTH FRONT BUCKET SEATS 6-way manual driver (up/down, fore/aft, recline), 4-way manual passenger (fore/aft, recline) and removable adjustable head restraints (4-way). Ford SE with Magnetic Metallic exterior and Charcoal Black interior features a 3 Cylinder Engine with 123 HP at 6000 RPM*. VEHICLE REVIEWS Much like its upscale interior, the driving characteristics of the 2017 Ford Focus help it stand out in its class. the ride quality is smooth, quiet and docile on the highway or over broken city streets, but it still manages to handle corners well and feel especially sporty for the class. -Edmunds.com. Great Gas Mileage: 40 MPG Hwy. OUR OFFERINGS For over 35 years John Vance Auto Group has been a comfortable place to buy a car. Serving the Oklahoma City metro area and with 11 domestic makes to choose from we are sure you can find the next car, truck or SUV of your dreams. The John Vance Auto Group is located just minutes north of Oklahoma City in Guthrie, OK on I-35 exit 153. Come see why the John Vance Auto Group is a comfortable place to buy a car. All prices include all applicable rebates and incentives. Pricing analysis performed on 4/24/2019. Horsepower calculations based on trim engine configuration. Fuel economy calculations based on original manufacturer data for trim engine configuration. Please confirm the accuracy of the included equipment by calling us prior to purchase. REDUCED FROM $13,996! Lariat trim. In Good Shape. Leather Seats, Alloy Wheels, CD Player, Running Boards, Turbo, LOWER TU-TONE PAINT, LARIAT SERIES ORDER CODE, 7.3L (444) DI V8 TURBO-DIESEL POWER STROKE ENGINE. SEE MORE! KEY FEATURES INCLUDE Leather Seats, Running Boards, CD Player, Aluminum Wheels Privacy Glass, Keyless Entry, Dual Rear Wheels, 4-Wheel ABS, 4-Wheel Disc Brakes. OPTION PACKAGES 7.3L (444) DI V8 TURBO-DIESEL POWER STROKE ENGINE: 115 amp alt, dual 78 amp/hr batteries, engine block heater, exhaust back pressure valve, LOWER TU-TONE PAINT, LARIAT SERIES ORDER CODE. Ford Lariat with Dark Highland Green Metallic with Harvest Gold Metallic exterior and Medium Parchment interior features a 8 Cylinder Engine with 275 HP at 2800 RPM*. EXPERTS REPORT A viable option for those who need a hard-core pickup civilized enough for everyday use. -Edmunds.com. EXCELLENT VALUE Was $13,996. All prices include all applicable rebates and incentives. Pricing analysis performed on 4/20/2019. Horsepower calculations based on trim engine configuration. Please confirm the accuracy of the included equipment by calling us prior to purchase. CARFAX 1-Owner. FUEL EFFICIENT 32 MPG Hwy/23 MPG City! SE trim. ..BACK-UP CAMERA.. Turbo Charged..BLUETOOTH.. Brake Actuated Limited Slip Differential..CD PLAYER.. WHEELS: 17 ALLOY SPARKLE SILVER PAIN... EQUIPMENT GROUP 201A. KEY FEATURES INCLUDE . BACK-UP CAMERA. TURBOCHARGED. BLUETOOTH. CD PLAYER. Brake Actuated Limited Slip Differential REAR SPOILER, KEYLESS ENTRY, PRIVACY GLASS, CHILD SAFETY LOCKS, STEERING WHEEL CONTROLS. OPTION PACKAGES EQUIPMENT GROUP 201A Radio: Media Hub w/SYNC w/MyFord Touch, SYNC w/MyFord Touch & SYNC Services, 8 TFT screen, 9 speakers, 911 Assist, VHR, AppLink, Bluetooth, steering wheel controls, USB port and auxiliary input jack, SE Convenience Package, Dual Zone Electronic Automatic Temperature Control, rear air duct, Black Roof Side Rails, Perimeter Alarm, Reverse Sensing System, Power Converter 110V Outlet, CHARCOAL BLACK, CLOTH BUCKETS W/60/40 SPLIT REAR SEAT 10-way power driver's seat w/power lumbar adjust and driver seat back map pocket, WHEELS: 17 ALLOY SPARKLE SILVER PAINTED ALUMINUM (STD). Ford SE with Magnetic exterior and Charcoal Black interior features a 4 Cylinder Engine with 173 HP at 5700 RPM*. EXPERTS ARE SAYING The 2015 Ford Escape is one of our favorite small crossover utility vehicles, thanks to athletic driving dynamics, an inviting cabin and useful high-tech features. -Edmunds.com. Great Gas Mileage: 32 MPG Hwy. PURCHASE WITH CONFIDENCE CARFAX 1-Owner All prices include all applicable rebates and incentives. Pricing analysis performed on 4/25/2019. Horsepower calculations based on trim engine configuration. Fuel economy calculations based on original manufacturer data for trim engine configuration. Please confirm the accuracy of the included equipment by calling us prior to purchase.